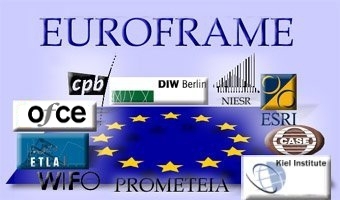 The EUROFRAME network was founded at the end of 1998 as an initiative of the nine independent research institutes towards more integrated forecasting and macroeconomic policy analysis in the European Union. In 2007 CASE joined EUROFRAME as the tenth member. The first President elected for three years (1999-2001) was Philippe Sigogne (OFCE). In 2002-2004 Gustav Horn from the DIW presided the network. At the end of 2004 John Fitz Gerald from ESRI was elected as the EUROFRAME President for the next three-year term. In November 2008 Wim Suyker from CPB was elected as the fourth EUROFRAME President for the next term. In November 2009 Ray Barrell from NIESR was elected as the fifth EUROFRAME President for the next term (2009-2011). In November 2011, Catherine Mathieu from OFCE was elected as the sixth EUROFRAME President. Since November 2014, Stefania Tomasini from Prometeia is the seventh EUROFRAME president. The history of co-operation between the EUROFRAME members includes the experience in producing joint macroeconomic analyses and forecasts, both independently and for the European and national authorities since 1998, as well as organisation of joint conferences and round tables. The group has built up experience of producing consensus-based recommendations on European macroeconomic policy from a team with widely differing approaches and orientations. Since 1998 a group of EUROFRAME members have been publishing a forecast of the European economies, which attracted widespread attention. In 2000 this group was expanded and took on a commitment to produce a report on 'The economic situation of the European Union and the outlook for 2001-2002' for the European Parliament. This report was produced in a co-operative and consensual manner amongst a disparate group of institutes, and played an important role in the policy debate in Europe after its publication in January 2001. These exercises can be seen as similar in intention to the current programme of work. From 2001 to 2004, the EUROFRAME group has been organising annual conferences on Growth Prospects in the Euro Area. In June 2004 the EUROFRAME started an annual conference series on 'Economic Policies in the European Union'. In 2004 the EUROFRAME group of institutes in cooperation with CASE won a tender for the re-launch of the "European Forecasting Network" of the European Commission in 2005-2007. The project started in January 2005 and has been successfully implemented over the last three years. Since the beginning of 2000 the group has been producing a leading indicator for euro area output growth that has been published monthly in the Financial Times/Financial Times Deutschland/Les Echos and has been widely commented on in the financial press. Since 2001, the EUROFRAME group has been organising annual conferences on Growth Prospects in the Euro Area. In June 2004 the EUROFRAME started the new conference series on 'Economic Policies in the European Union'. In 2004 the EUROFRAME group of institutes in cooperation with CASE won a tender for the re-launch of the "European Forecasting Network" of the European Commission successfully implemented the project over the years 2005-2007.